Little ones will have a splash-tastic time with the Finding Dory Swim & Swirl Water Table by Step2. This kid's water table encourages fine motor skills as kids squeeze and squirt water from Dory & Friends while splashing around. Kiddos can send Dory & Friends down the slide and into their own whirlpool with the water table spinner. Playtime doesn't stop outdoors; this play table can be brought indoors for sensory play use with rice or beans. 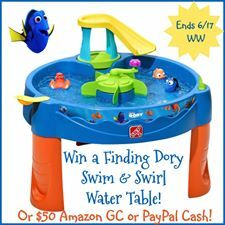 One lucky reader will win this Finding Dory Water table! They can choose $50 Amazon GC or PayPal CASH! My grandson says Nemo and Dory. I like Nemo and Dory. Dory is the star but Nemo is a sweetheart! My favorite character is Dory! Dory is my favorite character in both movies. I love her optimism. Dory who is played by Ellen DeGeneres is so funny. I love her memory loss and how she deals with it. Dory is my girls' favorite character! Dory will probably be our favorite! My favorite has always been dory, i love her!